When it comes to differentiating your service department from the competition don’t overthink it. Standing out from the crowd of other bike shops and subsequently winning loyal customers doesn’t take being the best – you just need to be better. Better than YOU were last week, better than YOU were last year. Pushing yourself and your coworkers to do better is the only way to be the best. So what does “better” look like in a service department? When you walk into your service area does it look like a place you’d want to bring your bike for service? If not then get organized. Get your tools and equipment in order. Remove clutter and junk and have a place for everything. Sweep and mop the floors on a regular basis. A clean and organized shop will make a great first impression with your customers, it will reduce both you and your coworkers stress and help you work more efficiently. Before you touch another vehicle make a checklist of items to inspect on every unit that rolls through your service department. No matter what service a vehicle is scheduled for don’t let it leave without it being subject to your checklist. For example in the case of a motorcycle you might want to inspect and or lube the drive chain, check the tire pressure and lube or check the side-stand for proper operation. 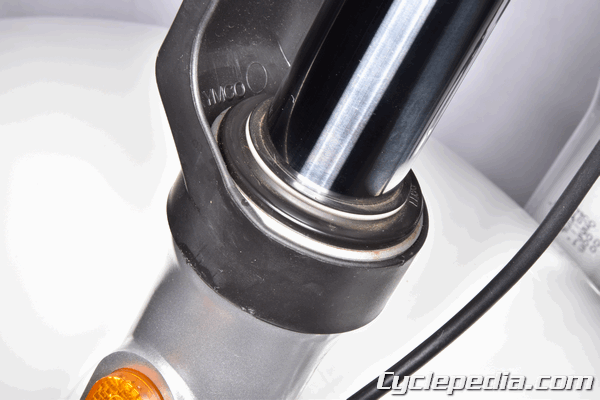 It’s easy to get used to a stiff dry side-stand pivot – but what a difference in feel once its properly lubricated. Once you start checking tire pressures regularly you’ll be amazed at how many people are riding around with low tire pressure. Bringing the tire pressure up to specification can make a world of difference in the feel of the bike and make it a whole lot safer to drive. When the customer hops back on the bike to leave the shop they’ll notice the extra attention to detail whether it be on a subconscious level or noticing how great their bike seems to ride. And while it doesn’t take much additional time to check tires or a side-stand, these small things can be the difference between keeping a loyal customer or sending them in search of another shop. Don’t keep it a secret that you went over the customers bike and noticed something that needed to be serviced. Since tire pressure can affect the handling of a motorcycle it’s a good idea to mention how much pressure you added as some riders have custom tire pressure settings they prefer. Do these small things free of charge to maximize their positive impact. This proves to your customer that you’re paying attention to the details and builds trust. Trust that will bring you future work and word of mouth. Paying attention is critical to providing better service. When a bike is on a lift you have a unique perspective to inspect for anything that might have been missed by the service writer. Look for things that are safety concerns or could turn into more expensive repairs later if not addressed now. It’s easy to spot a leaky fork seal if you take a moment to look for it. Check the tires for any damage, inspect the steering head bearings, look for fluid leaks, check the brakes. You can generate more work from the same bike while it’s on the lift or at least make the customer aware of items needing attention. The goal here is not the run up the bill on the customer but rather to look out for them and be their advocate. Don’t do fork seals and then send the bike out with 20% of the rear brake pads left when you could do both jobs and save the customer time. Let’s talk about brakes for a moment. Many shops replace brake shoes, set the fluid level and send the bike on its way. How do you do a better brake job? Next time consider inspecting the calipers – do the pistons move in and out smoothly? Are their any leaks anywhere in the system? Inspect the master cylinder, replace the brake fluid with new fluid and take the time to bleed the brakes. 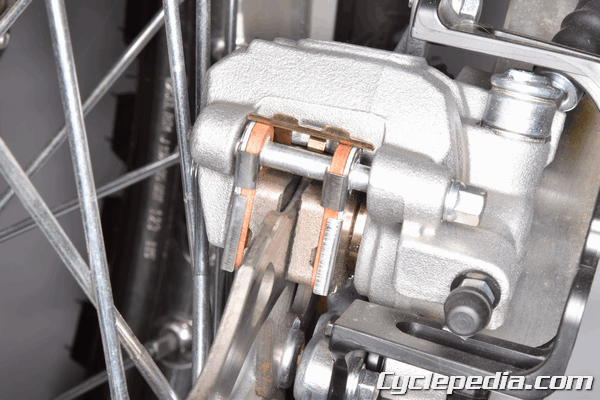 If the bike has a lot of miles or has been ridden hard check the brake disc thickness. When there is an ever changing parade of bikes in and out of your garage it’s sometimes hard to remember that each one is someone’s baby. Avoid damage while working by being careful and using protective covers, it’s not worth moving too fast and scratching or damaging a component. The last thing you want to do is hurry through a job only to have to explain or fix a dent/ding. When your work is complete be sure to carefully wipe off any finger prints you might have left behind. 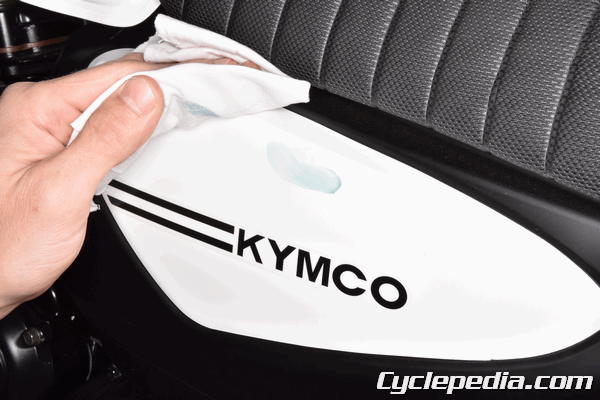 Grease and fluids can leave a real mess which is why so many bikes return from the shop with greasy fingerprints on shiny surfaces. Some customers can get really hot under the collar when they see smudges all over their air cleaner cover and gas tank. Despite that you might have done the best job replacing their clutch and getting their bike just right – all they see are dirty prints and that is how you may be judged. 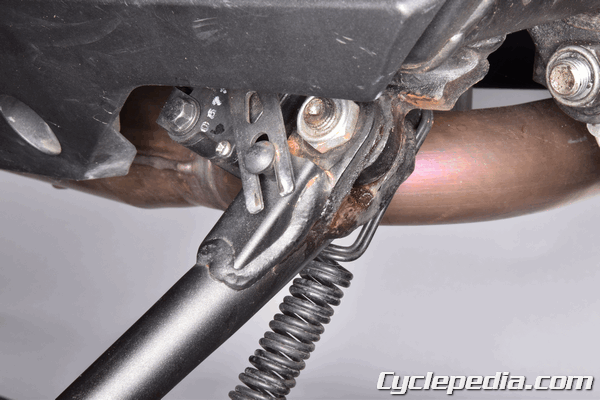 Step back and give the bike a quick once over to make sure it looks better than when it rolled onto your lift. We’ve only mentioned a few easy to address items that are unfortunately commonly missed by too many shops. Paying attention to these details can make the difference between the success or failure of your shop. Next time a customer brings their bike in for service we’re sure you can think of some extra things you can do to provide the best service, or at least provide service better than the rest!